Assignment: Radio's Ana Nospal investigates America's fear of vaccines, and what might be behind it. The Journal of Pediatrics recently published results from a study indicating there is no correlation between “too many vaccines too soon” and developing autism. According to the Centers for Disease Control and Prevention, more than 90 percent of American children entering kindergarten are immunized with most recommended vaccines. However, some parents either refuse to inoculate their children entirely or delay the CDC’s recommended schedule for injections. Maggie Pool is an Assistant Director for Clinical Services at Goddard Health Center on the University of Oklahoma campus. Over her 15 years working in the field, she has heard a lot of patients’ concerns associated with vaccines. “I think the most prevalent myth or rumor because it has never been proven is that the Measles, Mumps and Rubella vaccines causes Autism,” Pool says. While fear of the effects of immunizations might dominate media coverage, Pool says that many people who avoid vaccines are actually afraid of the physical experience of receiving one. 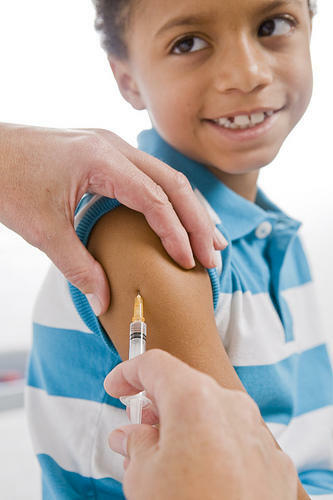 People who are afraid of needles might prefer a nasal spray vaccines for diseases like the flu. These sprays contain a living but very weak strain of the disease. The number of children who have died from or were disabled by an infectious disease slowed to a trickle as vaccination became more common, but it still happens. According to the CDC, of the 105 influenza associated pediatric deaths in 2012-2013, 90 percent of them had not been vaccinated. Recommended vaccination schedule from the CDC for the first 6 years of a child's life. One reason parents are hesitant about vaccinations might be counterintuitive. Because vaccines have been so successful, Pool says Americans have forgotten how horrible these diseases can be, especially those which have been almost completely eradicated in the US. She warns that while these diseases are rare they do sometimes appear, are highly contagious and sometimes life threatening. Without preventative measures like vaccines these diseases could make a comeback. Miroslav Pendaroski, a professor of psychology at MIT University in Macedonia, explains why he thinks the fear of vaccines exists and will likely continue to exist, regardless of media coverage or research findings. Pendaroski says people tend to favor information that confirms their own personal, pre-existing beliefs or hypotheses about something. With the information so readily available online today, it’s not hard to conduct some quick research and find a community of people who agree with you, no matter what the subject or your opinion on it. Geek out: Make your own vaccines!